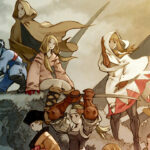 For all lovers of tactical turn-based RPG and in particular for those who have never forgotten Final Fantasy Tactics, I have prepared this list of the 4 games that are closer to the SQUARESOFT jewel. Final Fantasy Tactics, a game developed by Squaresoft that at that time held the monopoly of jrpg. They invented this mix of tactics and role-playing by proposing this original development job class system with fights on a grid-based map. I spent hours playing it trying to develop the most advanced classes and finding the unique items from the various side quests. The story was certainly one of the fundamental points of the game, full of intrigues and twists. Fortunately, several Studios over the years have imitated the formula of Final Fantasy Tactics, some with bad results and some with good results. Side quests and secrets to unlock. Developed by 6 eyes studios, Fell Seal is presented as a turn-based strategy game very inspired by Final Fantasy Tactics. A deep class management system and an interesting story. The campaign will last approximately 25 to 35 hours with 10 hours of endgame content. In the game, there are 20 basic classes plus some advanced classes to unlock. You can get it for a good price on g2a. Developed by the Twin Otter Studios. Arcadian Atlas is a turn-based game strongly inspired by FFT for its mechanics, class management, and 2d isometric graphics. The combat phase of Arcadian Atlas takes place on grid-based maps created in 2d-isometric graphics. Some of the core classes we will find in the game are Ranger, Apothecary, Warmancer, Rogue, and others. The game still under development is scheduled for 2018 without yet a precise release date. Turn-based game set in the legendary world of King Arthur. The main character is Uther, a knight who will be looking for Excalibur. The management of classes and abilities is different from FFT but offers greater depth in the combat phase. In every fight, we have to be careful and be good at exploiting traps, precipices, and explosive barrels. You can get it here for a very cheap price here. An interesting game with turn-based mechanics in pure FFT style with innovative combat system linked to cards. The game developed by CARDBOARD UTOPIA and produced by SQUARE ENIX is already available. Here is the link to the steam page of the game. A promising under developing turn-based tactical RPG by indie Drix Studios recently entered the kickstarter campaign. Grand Guilds presents an original card system that mixes with classic turn-based mechanics. Here’s the link to the steam page of the game. In Fae Tactics, follow a young magic user named Peony on her journey across a vibrant world full of mystery and danger. Summon allies, cast spells, and befriend a motley crew of characters as you dive into the growing conflicts between man and magical beings known as fae. If you know other games like Final Fantasy Tactics do not hesitate to leave your comment and if you like you can join our Steam community.